Continuing the mental health vibe, I was immediately captured by Lili’s posts on the Bullet Journal Junkies Facebook group – it was such a thoughtful way to use bullet journaling as a way to manage and cultivate mental health. I had to have her share her wisdom with the rest of us! Note: This post contains affiliate links – which means if you happen to purchase something I make a small commission at no additional cost to you, which helps run the blog – thank you for your support! I first learned about the Bullet Journal system in early 2016, when I saw the original video by Ryder Carroll. I started using it, and almost immediately found that I loved it as an organizational tool and as a therapeutic tool. Originally, I found drawing spreads and adding colors and the occasional doodle to be very soothing. As I continued with my journal, I further explored how I could make it my own and make it the most useful tool for me. After a fair amount of experimenting (which I continue to do to this day), I found that my bullet journal was most useful to me when it contained lists and reflections on mental health in addition to the future log, monthly, and weekly/ daily logs. A lot of my life is spent looking at the world through a mental health lens. I experience Generalized Anxiety Disorder and Depression, and I treat these conditions through medication, therapy, self-care, and mindfulness. One aspect of self-care that has always been useful to me is finding a creative outlet. Over the years, this has included jewelry making, knitting, and collaging. When I learned about the bullet journal system and how it can overlap with creativity, I found my niche in making pages that support my mental health and are as colorful as I want them to be. I love that when I look at my journal, it is full of colorful pages that help me structure and live my best life. I find inspiration for my mental health pages from a wide variety of sources. I keep a lookout on social media (Facebook, Pinterest, Instagram, etc.) and save pictures, lists, and articles that I think I may want to use in my journal. I also sometimes do more specific searches if I notice that I am struggling with a particular issue and want to help myself work through it. Additionally, I sometimes receive articles and educational materials from my doctors and therapists, and I frequently transfer the ones I strongly relate to. Lastly, many sweet friends, both from my offline life and who I’ve met through the bullet journal community, send me articles and links, which is always highly appreciated. Once I find an article or list that I feel would be beneficial to me, I pick out my materials and transfer it over. Because I love rainbows, I almost always choose a rainbow color scheme, but whatever color scheme or other theme works great too. Depending on the length of the article, I sometimes add decoration such as drawings, stickers, or washi tape. These embellishments serve no practical purpose, but they do make me happy! Adding these mental health lists and articles actively supports my mental well being in two ways. First, when I copy the lists, I am actively reading and absorbing the content. These lists often include strategies I am trying to incorporate into my daily life, so taking the time to write them down helps me solidify my knowledge. I think of it as a very decorated way of taking notes. Second, once I have these mental health lists in my journal, I can refer back to them whenever needed. Sometimes I read through older lists when I feel that I need a refresher. Sometimes I have high levels of anxiety, and reading these lists can help me work through those times. When I am in an anxious state, it can be hard to think straight and remember my coping strategies, so having them written down can be a great reminder during a difficult moment. I have shared some of these lists and my Instagram account with loved ones, and it has educated them on ways they can help me when I am upset. Additionally, because I have made the pages look exactly as I want them to (with copious amounts of rainbow colors! ), just looking at the pages can also feel soothing to me. As a part of a larger system of mindfulness and treatment, my journal is a highly useful tool in keeping myself calm and grounded. Your bullet journal is for you, and only for you! Don’t be afraid to make it in exactly the way that makes you most happy. For me, this means a ridiculously bright rainbow color scheme, complete with Lisa Frank stickers. For you, this may mean a totally different thing- maybe you like to decorate with a different scheme, or maybe you prefer not to decorate it at all. Don’t worry about what is popular- do what YOU want to do. After all, you will be the one referencing the journal and actively using it as a tool. Don’t be afraid to make mistakes! I can be a perfectionist, but I have learned to let that go as much as I can. Sometimes the ink smudges or I draw a line in the wrong place. This can be frustrating, but I try to just work with it. Sometimes a well-placed sticker or washi tape accent can be useful for this. Other times, the mistake is there and I embrace it as best I can. I have made a promise to myself that I will not start over once I’ve started a page- I will still work through and love it, even if it is not perfect. Experiment! It took me close to a year to find the journal setup that I like best, and even now, I still frequently change little parts of it up. If you try something and don’t like it, that’s okay! You can learn from that experience and try something different the next time. Use your journal as one of many aspects of your self-care! For me, journaling is an awesome creative outlet that helps me stay calm and work on my mental health. I have a desk where I work on my journal, have colorful storage for my supplies, and watch shows on Netflix. This space and my journaling routine provide a comfortable space for completing my planning routine. I also use other self-care tools, including exercise, reading, spending time with loved ones, and getting out in nature. Your journal can be a wonderful tool, but it has to be one of many tools you use to help yourself. Lili is a teacher and bullet journal enthusiast from Portland, OR. 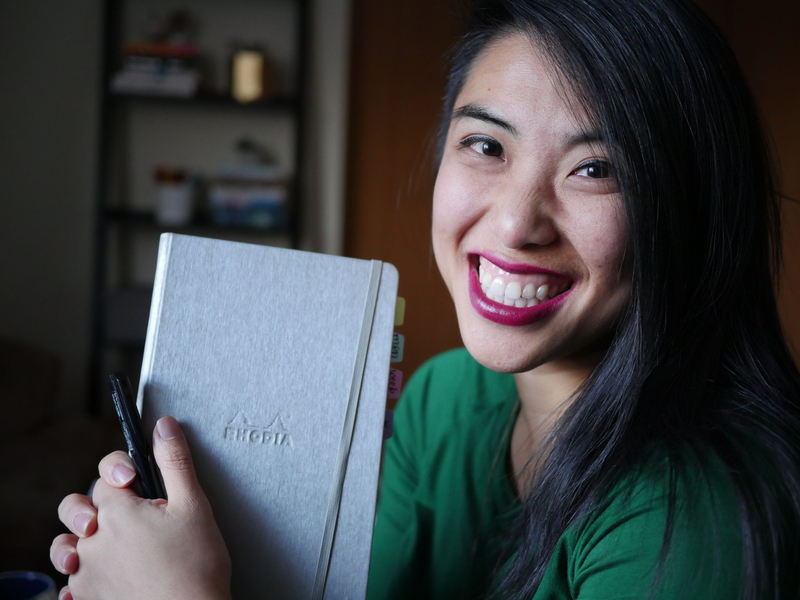 She hopes inspire others to use their journals in a way that helps them lead their best lives, physically and mentally. You can find her on Instagram @rainbowbulletjournal. I love these spreads. Although I don’t have anxiety, I do have depression, codependency issues, and low self-worth, so I loved to see how you use the bullet journal as a therapeutic tool. I think I will definitely begin to incorporate these ideas into mine! Thank you for the post! What a great post! Love all of the mental health aspects you took and the action plan steps of how to deescalate those feelings! This is a great article! Thank you for sharing it. Also, thank you for mentioning the FB group, I requested to join! I’m doing a lot of experimenting with my BuJo myself. I just learned about BuJos this past May. I love it! great ideas. I am in the researching phase of bujo. I have several mental health issues and may copy a couple of yours. thank you for sharing. I can SO relate to overthinking; I took a screen shot of that page to make in my BuJo. Lately when I catch myself overthinking I say “Do it or Don’t…but stop thinking about it!” It’s really helped me stay present and move on. I love bullet journaling but it has been a while since I have written in mine. Your article is such an inspiration to get back to it. Thank you for sharing! Wow, love your journal. So beautiful and colourful. I adore this post. There are SO many good tips in it. I love that the importance of writing to absorb an article’s meaning is emphasized; taking the time to handwrite something gives your brain the chance to catch up with and permanently store what you’re writing about. This post is fantastic! I am going to use some of these tips for my 10 year old son who struggles with anxiety, and I’ll add the overthinking strategies to my BUJO because I too struggle with that. Thanks so much for sharing! This post is brilliant – and such a good idea! I particularly love your ‘I know that’ page and of course all of the rainbow colours you have used! I LOVE these! I was just discussing anxiety with a loved one the other day and different coping techniques I have – but biggest if just remembering that it’s temporary, and not to make any decisions or actions on these things until you’re feeling better! It’s so hard. Thank you for the great ideas! Thank-you so much for sharing this! I’m looking into bullet journaling to help with my mental health, and this gave me some great new ideas. These are great! Thank you for sharing your ideas. I can’t wait to implement them in my bujo.